OEM specified. Noncorrosive gasketing material designed primarily for use on aluminum, iron, and steel flanged mating surfaces. 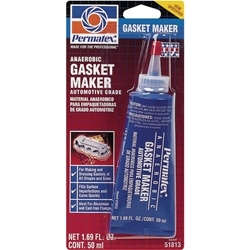 Ideal for on-the-spot and emergency repairs, or when a conventional gasket is unavailable. Fills gaps up to .015" and cures to a solvent-resistant seal that will not tear or decay during service. Parts disassemble easily even after extended service and old gasket material can be removed in minutes with a simple putty knife.